One of the interesting aspects of Esther Venrooy and Ema Bonifacic’s installation A Shadow of A Wall is that the relatively soft and slowly changing and shifting field of sounds that Esther created, will combine with the sounds of the city that come floating in from outside. 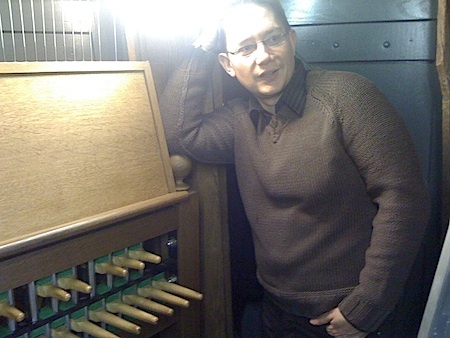 In order to emphasize that side of the work, Esther had agreed with Maastricht’s city carillonneur Frank Steijns to try and arrange for a number of specially created melodies to be played regularly on the carillon of the Maastricht town hall, maybe not all the time, but at least for a part of the duration of the Resonance exposition in the workspace of Intro in situ. That of course was a wonderful idea, for indeed, as Esther explained to the visitors of the Café In situ evening in Maastricht on Tuesday January 18th, those bells are the sound of the city. 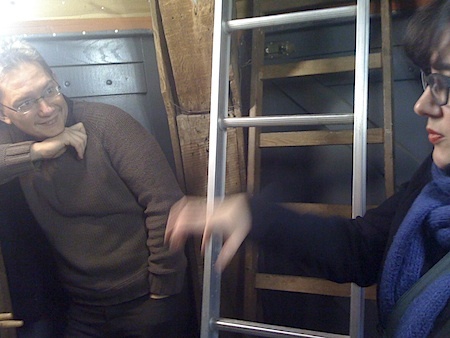 Earlier that same day, Frank took Esther and me all way up into the town hall’s belfry, to visit the carillon and explain us all about that wonderful instrument and its history. 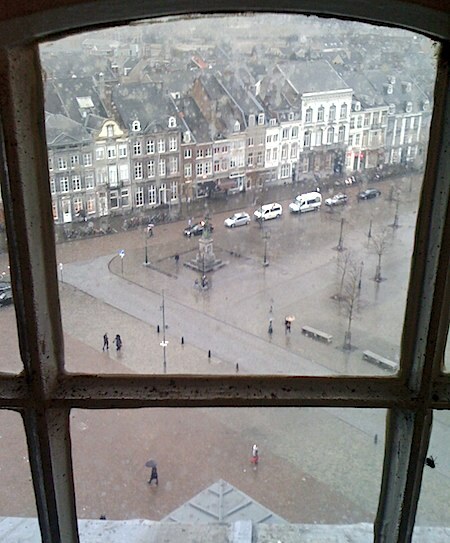 We passed via the town hall’s attic and from there climbed ever steeper 17th century wooden ladders, higher and higher, all the way to the open, windy and rainy top where one can find the bells. The oldest among these were among the last bells founded by the legendary Hemony brothers. At successive stages of our ascent we came across ever more modern mechanisms for the automatization of the chiming of the bells, with hammers to strike the bells on the outside. 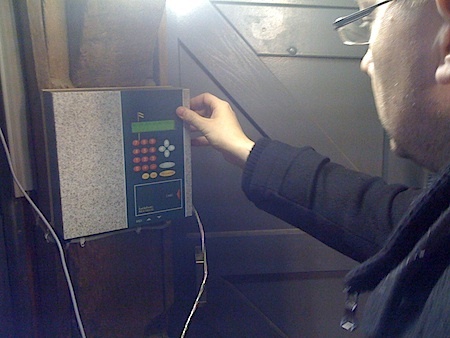 The automatic chiming has been applied in Maastricht since 1910. From that year stems the enormous solid brass drum, the speeltrommel, made by the Dutch bell founders firm Eijsbouts. One level up we came upon yet another abandoned system for automatic chiming of the bells, also produced and installed by Eijsbouts, with – as Esther obseved – a very 1970s-like look, reminiscent of the futuristic machines we all love and know from watching too much science fiction and too many Dr. Who’s. This one, a bandspeelwerk, is an electric relay system, operated by a broad white plastic tape in which holes have been punched, much like the book organs used for the playing of mechanical street organs. The holes here, however, are all of the same size, as the bells need just to be hit: there is no sustain, other than their resonating until being hit again. This part of the town hall’s belfry looked as if it also served as the municipal dovecot. Which of course might be a thing of great value, as pigeons could provide the last possible reliable means of communication when in time of local, national or global disaster all other means fail. The pigeons responsible for the mess, however, were not civil servants, but mere squatters, that last summer invaded the tower, though no one actually has been able to find out how and where they managed to get in. 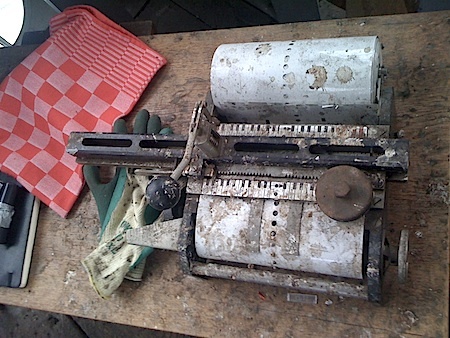 Their presence accounts for the deplorable state of the nice little machine that is used to punch the holes in order to produce the tapes that are used to operate the bandspeelwerk. We passed another level (where four perpendicular metal axes parting from the room’s center operate the clocks that are on the four sides of the tower) and then, from the outside came through a door in the tiny room with the carillon’s baton keyboard (the stokkenklavier), from which one more ladder leads up to the bells. Up in the ‘control room’ Frank and Esther discussed the sounds and melodies to be played each quarter hour between 8 am and 10 pm, as part of the final week of the exposition of “A Shadow of A Wall” at Stichting Intro in situ. For this, Esther had determined five central notes, based upon the dimensions of the wooden panels used in the installation. She had written them down on the first page of a small note book, that she put on the carillon keyboard’s music stand: cis-4, cis-5, d-6 (approximately), ais-5 and cis-3. Frank then played around a bit with these notes, by hitting the corresponding batons of the keyboard. He improvised and showed a number of possible ways of playing them, in the original sequence, or as a transposed one, with or without more or less quick arpeggio’s, simulating glissandi from one cis or fis to another… I am pretty sure that out in the city people looked up and wondered about the curious patterns of sound that suddenly came chiming down from the town hall’s belfry. It was a short foretaste of what the city would sound like every fifteen minutes on the days later this month, when the carillon would become a part of “A Shadow of A Wall”. Of course Frank himself will not be up there every day of the week from 8 am till 10 pm, to play these melodic patterns manually. 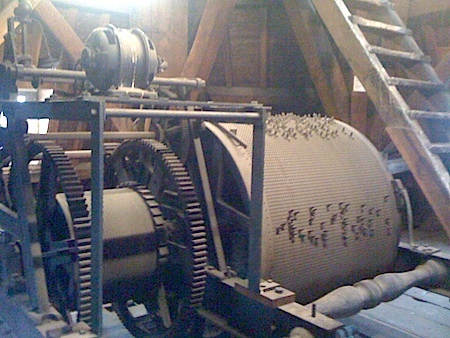 The playing will be done automatic, applying the mechanism for automatic chiming that is currently in use: a computer interface, built and maintained by bell founders Petit & Fritsen, who also provided (in 1997) the most recent bells that were added to the carillon, which currently counts 49 bells. There will be other cities. The next installment of “A Shadow of A Wall” will be later this year in Kortrijk, Belgium. There is a fine carillon also in Kortrijk. Esther Venrooy‘s and Pierre Berthet‘s Resonance installations can be visited at Intro In Situ (Capucijnengang 12, Maastricht) until January 30th, 2011. Opening hours: Wednesday till Sunday, between 12h and 17h. Entry: €3,-. On Sunday January 30th Peter Kiefer will talk about sound art and his recent book Klangräme der Kunst (Sound spaces of art), at Bookshop Selexyz, Dominicanenkerk, Maastricht. 13h30. After Peter’s talk all are invited to come over to the Intro in situ workspace for a drink and to visit the Resonance exposition. 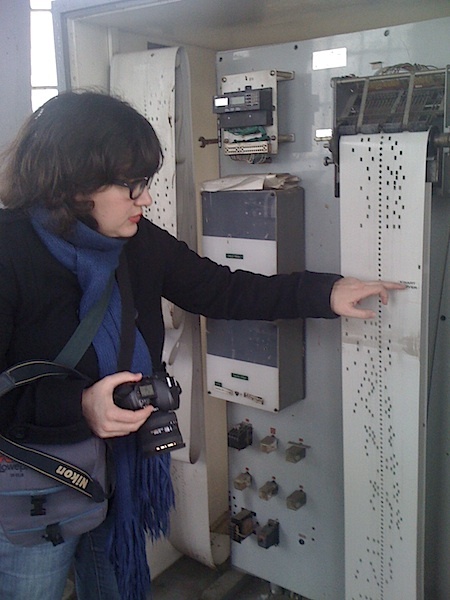 You are currently reading The Bells are the Sound of the City at Resonance - European sound art network.